Everyone is welcome to our Sunday celebration. The time is open and informal, with a strong emphasis on stories of what God is doing today in our lives, Biblical teaching and worshipping God together. We celebrate Holy Communion fortnightly and every couple of months we have all ages in together. We aim to finish around 12.15pm with tea and coffee afterwards. Children and youth provision on Sunday mornings is listed in their sections below. Waiting Room is a spacious time together. It's a place to wait on the Lord and while there is no set agenda for the evening you can expect there to be a blended mix of worship, prayer ministry and listening to God. We usually wrap up around 9pm, but it can be variable depending on how the evening develops. We normally meet for five or six sessions fortnightly in the term. Check out the term card for specific dates. 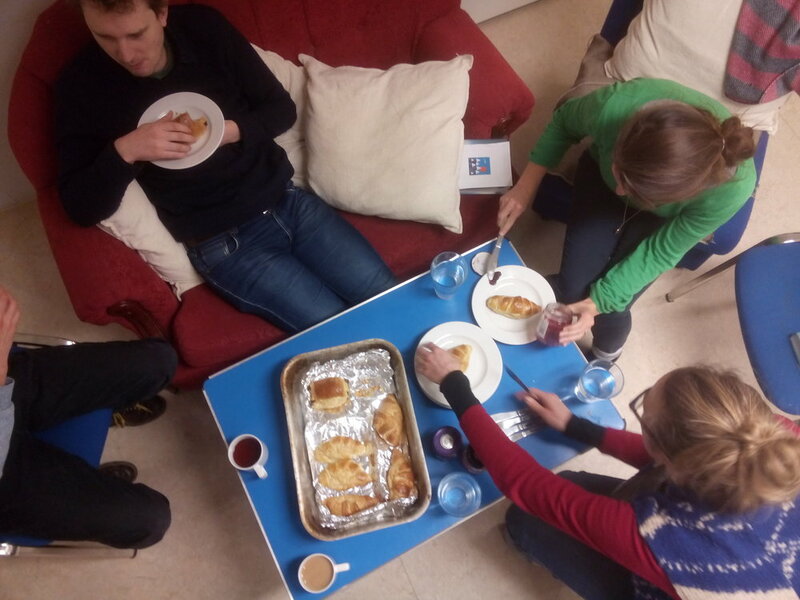 Our weeknight community groups (CGs) are a vital space for discipleship and developing community – whether this is over good food, through worshipping and studying the Bible together, or through sharing and praying for each other. There are currently six CGs meeting in people’s homes across the Winstanley Estate and further afield, and all members of the church family are encouraged to be part of a CG. Do get in touch to know more. InnerSeed has been meeting weekly for many years now and keeps the St Peter's intercessory flame burning, in and out of season. We believe that intercession is agreeing with heaven and releasing its reality into our world. Join us for half an hour of prayer followed by freshly-baked pastries. Throughout the year we also have times of 24 hour prayer and at the Centre there is a prayer room that is open for church family to use for personal prayer throughout the week. Contact us here to book a place. We are a church that believes in the power of prayer. We believe that God has called us to be agents of His blessings and healing power and so we love to go out into the community on Wednesday mornings and offer prayer to those we meet. While it can feel a little intimidating going out for the first time we've constantly been amazed by peoples' openness to the offer of prayer and we love to come back with stories of people encountering God, being healed and super blessed. You can read about some highlights in our blog here. Contact us here if you'd like to know more or just turn up at the church at 9.30am to join us - no experience necessary! Over the winter St Peter’s will host a night shelter, as part of Glass Door’s Wandsworth circuit of shelters. The shelter, run by Glass Door and volunteers from St Peter’s, provides a warm, safe and welcoming space for around 15 guests, who also receive a hot evening meal and a cooked breakfast in the morning. Glass Door help guests find work, housing and more and over the past 12 months they have helped 122 people into stable accommodation.